Prebiotics are fibers, mostly plant-based, that nourish good probiotic bacteria in your gut. Other plant-based dietary fibers can be non-selective and impact growth of a wide variety of bacteria in the gut. The gut world is competitive, home to about a trillion microorganisms—both good and bad—that impact our overall health. Feeding the good probiotic bacteria with prebiotics can help tip the balance in their favor. In other words, prebiotics make probiotics happy, and happy probiotics make for a happy, healthy gut...which leads to a happy, healthy you! Natural food sources like green bananas and onions also contain prebiotics, but usually in small amounts. You’d have to eat at least 15 green bananas to get an effective dose of prebiotic! Or…you could have one can of Wonder Drink Prebiotic Kombucha: Zesty, fun, and functional, with only 10 grams of sugar in each 12 oz. can. Go ahead and #TasteTheGoodness…your gut will thank you! We wanted to make a kombucha that had a little something extra, a gift of goodness for your good, live gut bacteria. So, we made the first and only Prebiotic Kombucha using prebiotics from an organic plant fiber called xylo-oligosaccharides. “Xylo” selectively nourishes good bacteria (more specifically Bifidobacterium species). Other prebiotics and dietary fibers break down in kombucha, may have side effects, require consumption in large doses, and can promote the growth of unwanted bacteria. Prebiotics and probiotics are the buzzwords in gut health and they’re on shelves everywhere. But how are they different? Which is better to focus on for gut health? What roles do they play in helping us live our best lives? Healthy eating shouldn’t be boring. We came up with three fruity, bold, and exciting flavors to keep your taste buds as happy as your gut. 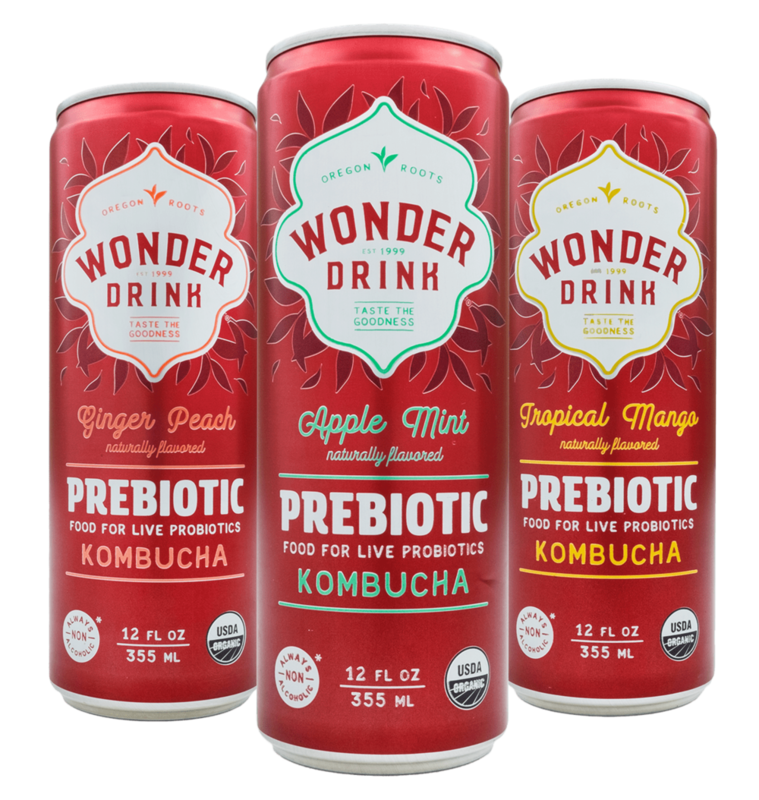 Vegan, guaranteed non-alcoholic*, non-GMO, and gluten free, Wonder Drink Prebiotic Kombucha contains lactic and acetic acids, as well as polyphenols. Say hello to your gut's new best friend.